You are encouraged to read the full report over here, but I want to focus on how South Africa is faring. 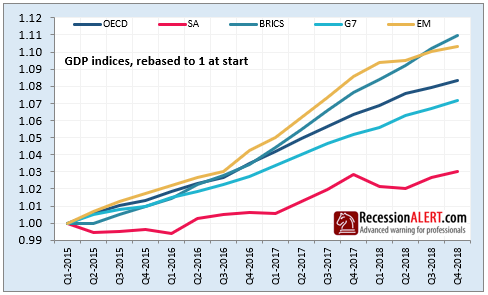 How is it possible that SA completely missed out on the current global economic expansion that has now come to an end? As a commodity exporter, we should be having happy days in global economic upswings. The answer is unpleasant as it is simple - over a decade of poor/mismatched policy, lack of economic leadership in government, rampant corruption and state capture, poor infrastructure development, a glaring and worsening dearth of skilled technocrats in government planning and operations due to cadre deployment and a wholesale destruction of State-Owned Enterprises finances. The chickens have proverbially come home to roost. 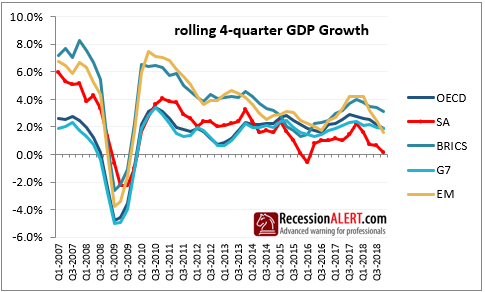 Frankly, we were lucky to get away with 0.17% annual growth if one considers how poorly the country’s economy, infrastructure and SOE finances have been run. The current government has learnt the hard lesson espoused by Bill Clinton’s successful 1992 U.S presidential campaign against then-sitting president George H. W. Bush with the phrase "It’s the economy, stupid". Because let’s face it - no amount of populist rhetoric, expropriation, nationalization, race-based regulation,�red-tape and further bailing out of ill-fated SOE’s by the taxpayers is going to fix the economy, just like none of it helped the economy in the last decade. We really do need radical economic transformation, but the problem is that this is focused on transfer of ownership in its messaging as opposed to transformation in its effective management. Look, this is just my humble opinion and admittedly some of them have been flawed in the past. 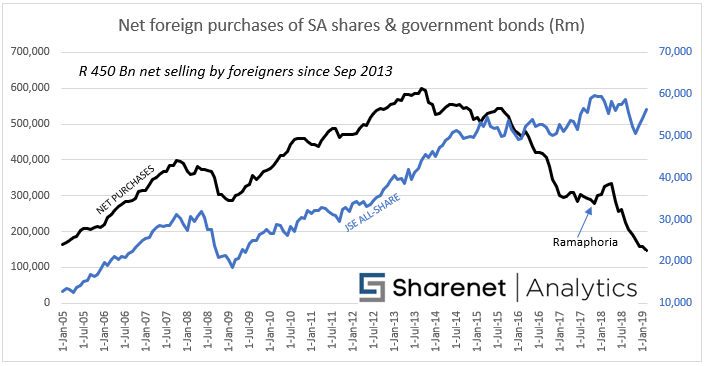 These "portfolio inflows" represent approximately 50% of the inflows recorded on the SA financial account, with Foreign Direct Investment (FDI) the next largest at 20%. The fact that FDI has collapsed from 36% to 20% over the last decade makes us even more reliant on these portfolio inflows. Do not make the mistake of blaming external forces beyond our control on our woes. Global interest rates we don’t have control over, but Emerging Market (EM) inflows have actually been on the up-and-up in 2019. And these EM’s are growing their economies at 3% or more, whilst we languish in borderline annual GDP recession. TAKEAWAY: If foreign investors see the movement toward a professional technocratic government, with well-placed policies and zero tolerance toward corruption and better deployment of our scarce debt funding (as opposed to spending debt on wages) then money will flow back into SA to fund our twin deficits and social and infrastructure programs. It’s that simple. If this indicator starts moving up, the government is moving in the right direction. Companies listed on the JSE are a reflection of our underlying total economy. You can tell a lot about a company by examining their dividend paying record, the most important being that management only raises dividends when they believe that earnings have permanently increased. This implies that firms that continually increase their payments envisage a positive outlook for profitability. TAKEAWAY: If JSE companies start generating more profits due to an improving economy, and management feel things have made a lasting turnaround, they have free cashflows to start paying out and regularly increasing dividends to shareholders. Companies listed on the JSE are a reflection of our underlying total economy. If companies start posting earnings growth it means they have improved operating conditions. TAKEAWAY: Whilst a lot of improved earnings may be due to superior management performance or fortunate circumstances or new product niches, if a broad swathe of the JSE increases earnings then more than likely the economy is improving. It’s an excellent measure of governments attempts to turn the economy around. The Absa Purchasing Managers’ Index™ (PMI™) compiled by the Bureau for Economic Research (BER) and sponsored by Absa, is based on the widely used and highly regarded Purchasing Managers Index (PMI) produced by the Institute for Supply Management (ISM) in the USA. The PMI is an indicator of economic health for manufacturing and service sectors. The PMI is calculated as the weighted average of Production, New Orders, Employment, Supplier Deliveries and Inventories. The survey from which the indices are compiled require the respondents to indicate each month, whether a particular activity (e.g. production) for their company has increased, decreased or remained unchanged. TAKEAWAY: The purpose of the PMI is to provide information about current business conditions to company decision makers, analysts and purchasing managers.�But the government should take note of it too and it’s an excellent tool to measure if the economy is getting better or not. Every month we count how many shares went up on the JSE and subtract how many shares went down. The result is added to the previous month’s number. If the line is moving up, more shares are advancing than declining on the JSE. If the line moves down, more shares are declining than advancing. This is a very useful way of measuring health on the JSE as the JSE is too heavy weighted, with a single share NASPERS making up almost 20% of the index. As a result, using the JSE index price movement to gauge the health of the economy can be very misleading. TAKEAWAY: If this line moves up it means we have a broad participation rally with more shares going up than down. This means local and foreign investors predict better times ahead for all these shares and the economy (as the stock market is a forward-looking indicator). 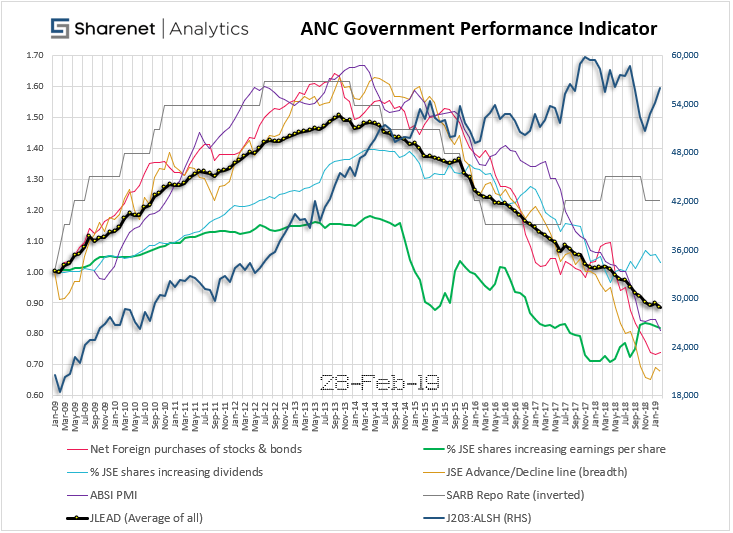 This is one of the most powerful indicators for the JSE and indeed the economy. When the SA Reserve bank is lowering rates, it leaves more money in consumers’ pockets which they can use to spend on things and boost the economy. Debt becomes cheaper and individuals and corporations can leverage-up to grow. When the SARB is raising interest rates it’s a tightening noose around the economies neck. Less money is available to be spent on the economy and businesses have to spend more to service their debt. TAKEAWAY: When the economy is humming along nicely and inflation is in check, the SARB can relax interest rates and juice the economy. It’s the one tool at the government’s exposure that it has more direct control over than all the others mentioned here, but as Zimbabwe showed us if it’s not managed properly it can also ruin the economy. Look for a rate drop to get insights into the economy improving in the months ahead. Interest rate moves generally have a 6-month impact on the economy. Right now, the ANC Government economic performance Indicator is one-way traffic in the wrong direction. It’s really looking bad. 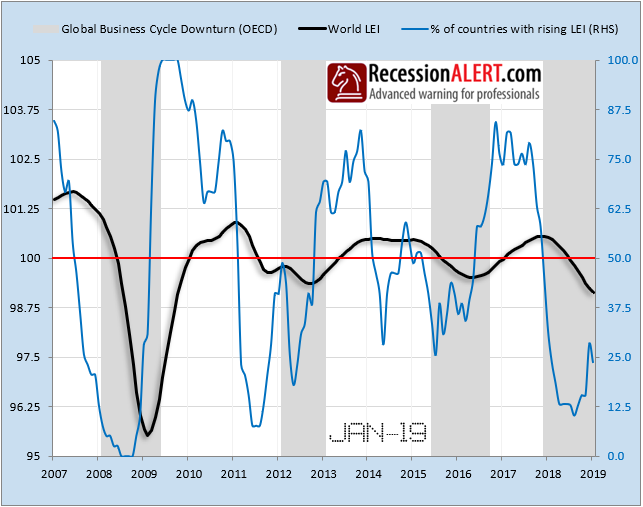 Until this indicator moves up or arrests its decline, you can consider the government to be ineffective at improving the economy. There are obviously many more indicators we could deploy to measure effectiveness of the government in managing our economy but these six cover a large enough swathe of things to be useful enough. Of course, this is focused on the economy only, which should improve things for unemployment and poverty. But as we have seen quite often in SA the economy can grow in a non-inclusive manner. And this is arguably not measured properly here. There are also other important things that the government is responsible for such as social development and poverty alleviation that are not measured here, but these can never be accomplished properly or sustainably against a backdrop of an persistently underperforming economy. Dwaine van Vuuren is a full-time trader, global investor and stock-market researcher. His passion for numbers and keen research & analytic ability has helped grow RecessionALERT.com (US based) and PowerStocks Research (now Sharenet Analytics) into companies used by thousands of hedge funds, brokerage firms, financial advisers and private investors around the world. An enthusiastic educator, he will have you trading and investing with confidence & discipline.